Fantastic job on the restoration,all by hand is definitely a labour of love. Spectacular to say the least! The "cheeks" and release on the front stock really add style. Moving the safety to the trigger guard also gives it a very modern look of a semi auto. Some one was ahead of the times in designing this work of art. The blue is the only part I can't take credit for. Hours and hours of hand polishing to remove most of the deep pits. Don't know if I would do that part again, but never say never. My smith then gave it his best to make it look presentable. the takedown Savage sounds like a great project gun. Soooo light and handy, excellent for dogging the bush. There are still very many in use up here in the deer camps. I think at that price you won't be disappointed . Wow, and I thought we had it bad in Canada! Welcome to the forum kumpe. Canuck, that's looks so much better! With a little tlc that old spring pole will outlast most of us. Roger that is certainly a very outstanding 8! I did not think a model 8 in such great condition would survive the years. Very nice. Mart the last options would,be to change out the sight for another as sometimes the bottom contour differ or hand fit the base of the sight you have to mate with the receiver. I have done both these with good success. Yes this is the same round , but renamed to avoid confusion with the 30-30 wcf rimmed . 30-30 Remington for the model 8 not Winchester 1894, I bet there was some upset hunters back then. Canuck, I had the same problem and used a Browning Auto 5 stock . Took me about two hours SLOWLY fitting it to my FN. These fit like a glove ! The round knob Auto 5 also fits with the only difference being the checkering . I use this one because the sissy pad is easier on my shoulder . This is a Redfield tang sight and it has windage adjustment,perfect for those guns that are problematic. I have two that have these and I definitely would buy another. That's a very nice FN. No extra holes and the original sight elevator. Good find! Great project gun and well worth it just for the parts. You can't go wrong with that! Two digit serial number and in very good condition, it doesn't get much better! Carl and Jack all the best in your speedy recoveries. It is always tough to go slow for recovery. Take care guys. I'm also having the same issue and hope this is not the new layout . I do not like to forage my way through a thousand items to view a select few. I suspect they are having issues that will be corrected. I am still searching for a first year model,never found even a beater. While I have not picked up any more FNs it would be neat to have one matching a model 8 serial number. The stock is a bit and dark and original. Jack1653, the serial number is around 2900 and dates to second year production. This is my first model 8 with the early safety. I have been looking a very long time for the right one. A few pictures will follow. Yes the cheeks have been shaped to make them stand out. This is my beater fun gun that I shoot often. The receiver had a big dent on the top by the peep and has had a tough life but still works flawlessly. In calibre 25 and 32. I picked this odd sight up a few weeks ago. Have not seen this make before and there is not much information on the net. Anyone have one. Fantastic collection of Police rifles. 30-30 Remington rounds first year or two production I think . 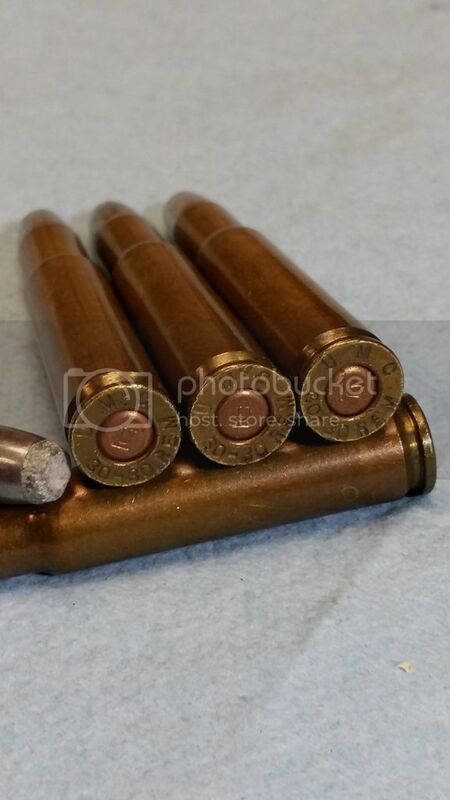 Found five 30-30 Remington rounds in my stash this week . I happened to check the headstamps as I also shoot 32 and noticed it was stamped odd. I think these were only made the first year or two. Pictures will follow. Bandersnatch, my I Pad seems to have the same problem with the new format. I will also try the pc. The model 8 in a video game,who would have thought! Now our secret is out and all the kids will want one. I had better get my jackitis top up. The take down latch on the forearm is a great addition. Old world craftsmanship is the way all the fns were build but this one is a cut above. Great score Jack! The length of pull looks to have been shortened and i think the butplate is to early for the serial number? Does anyone know the serial number the change of plates was made? This is only my speculation from a few pictures. A few issues but it is still an FN. I like the scope set up,nice rig. Good find! I would like to see a video on this. I bet most would hold minute of pie plate at 100 yards. It would take a lot of time to hand fit a set of rings to any one of those. Would make a great rig with a vintage Alaskan scope. Wow that's some serious cash! I do like the early serial number . The custom work well executed . The buyer should be happy to have a one of a kind right there.